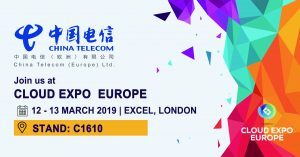 China Telecom (Europe) are a Silver sponsor at Cloud Expo Europe and would like to extend a personal invitation for you to join us there on 12-13 March at ExCeL London. Nothing beats face-to-face interaction and the opportunity to test and compare the latest solutions first hand. Visit us on stand C1610 and see what we can do for you. Gain knowledge and insight from over 800 industry leading experts such as BBC, Citi Group, Deutsche Bank, eBay, Ford, Giffgaff, gsk, Ikea, King, John Lewis, Sky and Twitter. Access a wealth of products and services to deliver the best outcome for your tech plans from over 700 technology suppliers. Visit the co-located events Cloud & Cyber Security Expo, Smart IoT, Big Data World, AI Tech World, Blockchain Technology World (NEW FOR 2019) and Data Centre World. Network and build contacts with over 20,000 technology professionals from across the ecosystem. Cloud Expo Europe is the only place you’ll experience the latest, best and most relevant emerging technology thinking. Your technology-driven objectives, be they single area or process changes, large-scale digital transformation plans or anywhere in between will be able to be deployed faster and with greater peace of mind after a visit to Cloud Expo Europe. Business leaders and tech management teams from enterprises of all sizes and the IT channel ecosystem. If you’re invested or investing in cloud-based solutions and services to help shape the future of your business you’ll find all the content, products and contacts to put your plans into action. Cloud Expo Europe is part of the UK’s largest technology event, incorporating Cloud & Cyber Security Expo, Smart IoT, Big Data World, AI Tech World, Blockchain Technology World (NEW FOR 2019) and Data Centre World. Access 8 event with one ticket, all for free! To arrange a meeting, email emea.marketing@chinatelecomglobal.com. We look forward to welcoming you to the UK’s largest technology event.